215 People’s Alliance Endorses Larry Krasner. We know that elected officials don’t change the system — we do. It’s our popular protest and organizing that changes our political system and holds politicians accountable. But our work is much more effective when we have people in office who already feel accountable to us. That’s why 215 People’s Alliance is proud to endorse Larry Krasner for the Democratic candidate for District Attorney for the May 16th election. Krasner has a 30-year track record of standing up for people’s movements. As a civil rights attorney, he has defended for free thousands of people (including many of us!) who have engaged in civil disobedience for social movements — from Black Lives Matter to Occupy to Act Up to those arrested protesting school closures. From now until Tuesday, May 16th (the date of the Democratic primary! ), we’ll be knocking on doors all throughout the city to get the word out about Larry Krasner. Please sign up for a doorknocking shift here! Our city has the highest incarceration rate in the country — every time the District Attorney’s office sends someone in Philadelphia to prison, it costs us $40,000. Imagine if that money were instead going towards our schools. 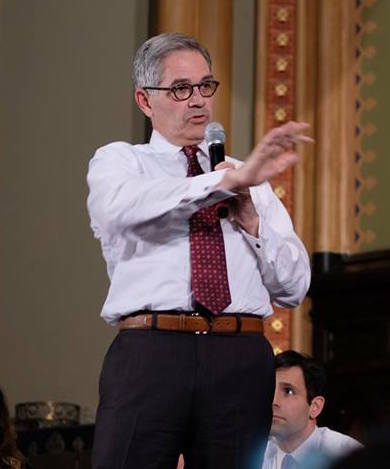 Larry Krasner is running on a platform of ending the current system of mass incarceration that targets Black and Brown communities, and instead focusing on programs and policies that address problems from the root. He will end the system of cash bail that keeps too many low-income people stuck in jail without convictions and supports an end to stop-and-frisk policing. We know that to win this election, we need to talk to thousands of people across this city — and we need your help! Sign up here to commit to canvassing shifts from now until election day on May 16th. And with such a tight race, every dollar raised is more people we can talk to on the doors – give to support 215 People’s Alliance and Reclaim Philadelphia’s joint effort to knock every door for Krasner. If you’d like to check out Larry Krasner and the other DA candidates for yourself, check out the coverage from Philly We Rise on the Philly DA for the People Candidate Forum last night!